A couple months ago I asked if the collaboration between Otter Creek and Lawson’s Double Dose IPA was the best IPA available in a 12 ounce bottle. At the time most agreed and while I am not sure DirtWolf from Victory tops Double Dose it is close. 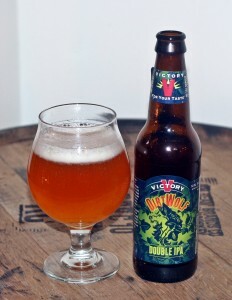 This is a truly excellent double IPA and certainly the best beer I have tried from Victory Brewing. DirtWolf pours a deep orange color with a bright white head. One place where DirtWolf lacks is in the aroma. Double Dose had a huge fruity nose while DirtWolf has more of a piney dank smell to it. Not unpleasant but I would buy an air freshener with Double Dose’s aroma and certainly would not with DirtWolf. Taste adds some nice citrus flavors to the pine but also is fairly bitter. This is an excellent DIPA but I think Double Dose still takes the title of best IPA in a 12 ounce bottle. Brewers Description: Darkly heroic, Humulus Lupulus (hops) have empowered brews with bite and character since the 11th century. DirtWolf is a tribute to these untamed vines which rise from the earth with the voracity of a “wolf among sheep.” Hops have made an assertive comeback in American craft brewing. Revel in the best U.S. varieties of hops, in their natural, whole flower form, as they bring a vital, pungent reality to the soul of a wild element in our dangerously satisfying DirtWolf Double IPA.